The CP4400 is the ideal toolbox for T2-MI generation and regional adaptation in DVB-T2 Single Frequency Networks (SFN). Thanks to its flexibility it simplifies the implementation of critical differentiators for network operators. The CP4400 offers a flexible and highly cost effective solution for generation of T2-MI transmitter feeds and regional adaptation of DTT multiplexes. 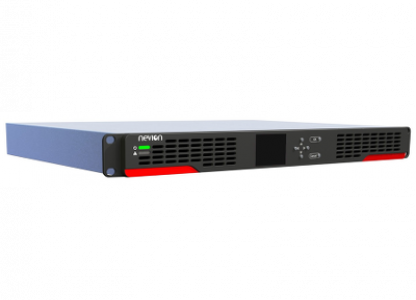 CP4400 can operate as a central DVB-T2 Gateway or based on Nevion’s deterministic remultiplexing technology for regionalization of DTT multiplexes. The deterministic remultiplexing enables feeding of transmitters in multiple SFN regions using the same Transport Stream (TS) as used in a pre-existing Direct to Home (DTH) satellite system. In addition to the powerful TS processing capabilities, the CP4400 offers several tools for the improvement of the transmission quality such as input monitoring, redundancy switching and diversity reception for TSoIP streams. Nevion cProcessors can be configured via an easy to-use web interface. Scheduled software upgrades can be performed via Nevion’s NMS or third party NMS.